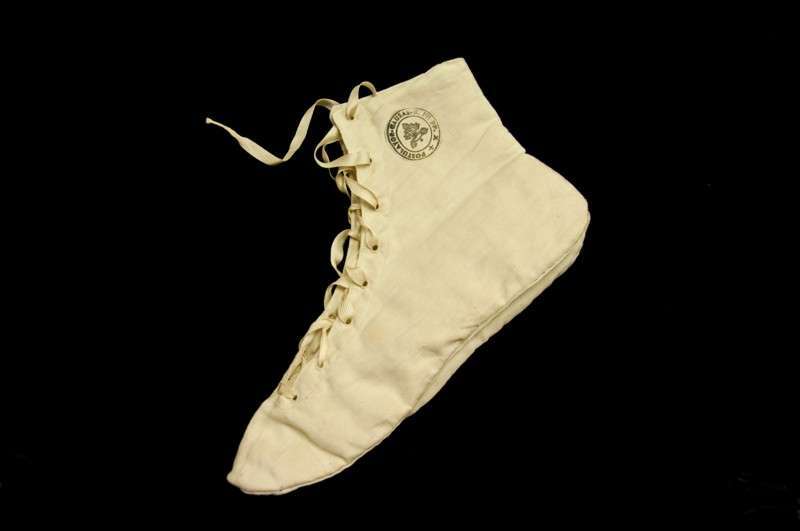 A PAIR OF PAPAL SLIPPERS WORN BY POPE SAINT PIUS X, CIRCA 1905. 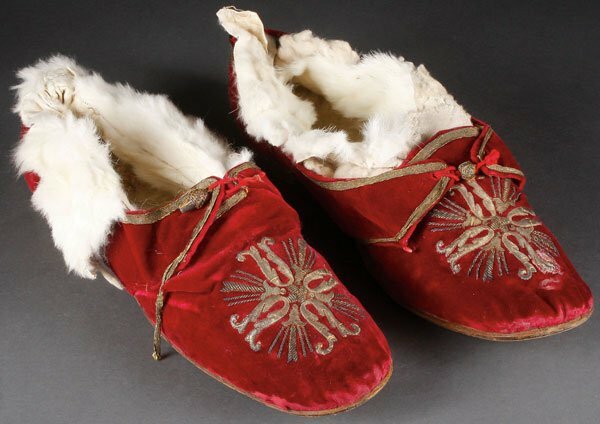 These papal slippers are red velvet shoes trimmed in gold brocade with crosses embroidered on the toes. The design includes rays of light emanating from the center and red silk ties. The interior is lined in white ermine or rabbit fur. The length of each slipper is 11.5 inches (29 cm). Pius X is a canonized saint, making these slippers a second class relic. “Pius X, like all of us had to wear shoes, but he wore them a little differently than we do. When he was elected, his sisters actually moved to Rome to take care of him. He was a man who was in very poor health. He had very poor circulation. So if you see pictures of him you’ll often see him with very puffy hands. And that was an indication of his poor circulation. His feet were the same way although you never saw them. When his biological sisters moved to Rome, they made special slippers for him that were more comfortable than actual shoes. He wore these on a day-to-day basis. It is a very humble aspect of the wardrobe of Pius X, but it helps us to see the very human and unique side of him. Other popes, of course, did not walk around in slippers like this. He did, because of his medical problems. This particular item is one about which people often inquire how I got it. Like many other items in the Collection, these kinds of things appear at auction houses for a whole host of different reasons. This particular item I bought at auction here in the United States. What’s happening in Europe, and it has been happening for decades, is the unfortunate decline in vocations. European nations have seen a drop as high as 40% in priestly vocations. The exception is Poland, which has increased. Some of these monasteries and convents actually cannot support themselves anymore for lack of vocations. So, unfortunately, what they’re doing is liquidating a lot of their own artifacts and valuable items, things they have had, maybe in archives or attics forever. We don’t know how some of these sisters got some of these items–maybe from a private audience with the pope himself or sometimes the pope sends a gift to a certain monastery or a convent. And so it’s actually a sad thing that is happening as to how these items are getting out of Europe. But at the same time I like to think I’m rectifying these circumstances a little bit, because I want to display these artifacts so that people can appreciate them. So they’re not just sitting in some sort of archive or in a convent or attic over in France or somewhere else. It’s not that this item is so significant in history, but it is so unique and so fascinating to have an item as personal as this that belonged to a pope who was canonized a saint. We have such a fascination with the inner lives of our Holy Fathers. On this slipper you can even see the ink stamp at the top of the slipper that shows it is from the promoter of the Cause for his canonization. And so, as his cause was in the process of moving forward, at that time they also distributed major relics. This item became available long after he died and, as his Cause was going forward, the promoter of his Cause gave this to some convent or to a priest as a gift, as a very nice gift. And so they added the stamp, saying that this came from the promoter of the Cause. Such a unique relic! A slipper that was made specifically for him because of his poor health.